The two main contenders in the race to become Ukraine's next president have been campaigning hard, with allegations of extremism, gangsterism, electoral fraud and assassination plots flying back and forth. Ukrainians, says leading opposition candidate Viktor Yushchenko, will choose between democracy and authoritarianism. The government candidate, Prime Minister Viktor Yanukovych, says it is hard-won stability and economic growth that are at stake. The mutual ill will comes across on the nation's TV screens - even though coverage ahead of the 31 October poll has been blatantly one-sided. "Television has become an influential player in the government's team," says Natalya Lihachova, media analyst for the Telekritika web site. "Instead of the usual information blockade, we now have an all-out war." News on the main TV channels is strikingly similar, evidence, she says, of the infamous "temnyky", or "theme lists" - the secret instructions allegedly sent to TV channels by government spin doctors. Viewers of Ukraine's two leading TV channels, Inter and One Plus One, would be hard pressed to find criticism of Mr Yanukovych. On state-owned UT1 a typical news bulletin leads with upbeat reports on the government's record - rising pensions, double-digit growth and increasingly cordial relations with Russia. But rising food and petrol prices, the hryvnya's falling exchange rate, opposition complaints, Western criticism or the deaths of Ukrainian peacekeepers in Iraq are all glossed over. And the long-awaited TV head-to-head between the main candidates fell through after Mr Yanukovych pulled out, saying he would rather prove his worth by "slogging away" than by engaging in debate. "Viktor Yanukovych stands to gain from a free and fair election more than anyone else," state TV said. "What speaks in favour of Viktor Yanukovych is the state of the economy." Opposition candidate Viktor Yushchenko's TV appearances by contrast are few and far between. 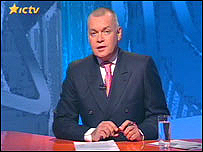 Comment about him by TV presenters is vitriolic - but Mr Yushchenko seldom gets a chance to respond. Minor candidates, whose ratings hover just above zero, are often shown accusing him of being a US poodle and a hater of Russia. "Yushchenko is a protege of the Americans, leading us towards a dictatorship of imperialism," says a campaign advertisement by Oleksandr Yakovenko. 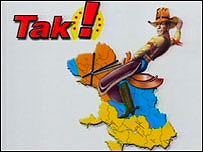 Another advert shows US President George W Bush riding cowboy-style across a map of Ukraine, against the backdrop of Mr Yushchenko's campaign logo. Mr Yushchenko's own adverts are usually sandwiched between clips of other candidates warning of the woes Ukraine can expect if the opposition leader gets in. Russian-speakers are told they will become "third-class" citizens. 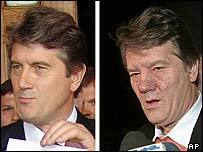 While Mr Yushchenko's own campaign is eclipsed, proclamations of support for him by small ultra-right groups are given generous coverage, in what the opposition says is an attempt to portray its leader as a rabid nationalist. Analysts were baffled when all the TV channels showed Mr Yushchenko's fiery speech in parliament after several weeks of treatment in Austria, in which he blamed his illness on a government attempt to poison him. Such attacks on the government are seldom aired on the main TV channels. But their strategy became clear, the opposition says, when Mr Yushchenko's speech was turned against him, and accusations that he lied about the poisoning plot filled TV screens. One commentator even suggested the poisoning could have resulted from a Botox shot, while pro-government Inter TV said Mr Yushchenko's illness stemmed from his love of sushi. "We know that this poisoning is a fake," announced anchor Dmitriy Kiselev of the ICTV channel, which is owned by the son-in-law of current president, Leonid Kuchma. Meanwhile the only openly pro-Yushchenko channel, 5 Kanal, is doing its best to redress the balance. The small, struggling outfit, which has periodically been kicked off the air on a range of pretexts, highlights opposition complaints of harassment by the authorities. Speculation over two criminal convictions Mr Yanukovych picked up in his youth (both quashed, according to the government), and to recent price rises also feature prominently in 5 Kanal's news. And the channel hit back over the poisoning issue, showing Mr Yushchenko's flushed and swollen face beside a photo taken two months earlier. "There is a striking difference. It is cynical to suggest that this was deliberate attention-seeking by Yushchenko or his entourage, as some have claimed," 5 Kanal said. Nor could it resist the temptation to gloat when the father of Russian pop star Filip Kirkorov, one of many artists recruited to campaign for Mr Yanukovych, mistakenly called on Ukrainians to vote for Mr Yushchenko instead during a concert - to wild cheers from the audience.